Even with my good intentions, I must admit that we continue to basically be wine givers when it comes to host & hostess gifts. Although…we did manage to bring a bottle of bourbon for a couple who loves a good drink on the rocks. So, maybe that’s progress! I think most party hosts would love to receive any of these gifts and I’m still going to make a good effort to branch out from the wine cellar when attending events at other people’s homes this year! 1. Tray from Target – I absolutely love the graphic nature of this tray and think it could work nearly anywhere in your house – the office, a guest room, a tiny bar in the living room. 2. Decanter Tags from Anthropologie – the bar cart trend shows no signs of stopping but when your liquors are stored in beautiful decanters it can be difficult to remember which is the rum and which is the vodka. Mr. Lemon and I purchased these for our own bar and we’re in love. Although I would have liked to stumble across a vintage set, you really can’t beat these for the price. 3. Fujifilm Instax Camera – a little on the pricier side of host gifts, these cameras are just too much fun and would be perfect for a family gathering or NYE party. 4. Set of Cards from Leif Designs – Leif Designs is local in my hometown of Grand Rapids and I can’t get enough of her beautiful calligraphy. And I love trying to get people to write letters again! 5. DIY Mini Copper Planters – Poppytalk show a lovely and fairly easy DIY that I think would be a great gift! I’m off to finish my Christmas shopping. And decorating. And wrapping. Less than two weeks left? Oh boy. I received no compensation for these endorsements – they are simply products I like. No affiliate links are included. 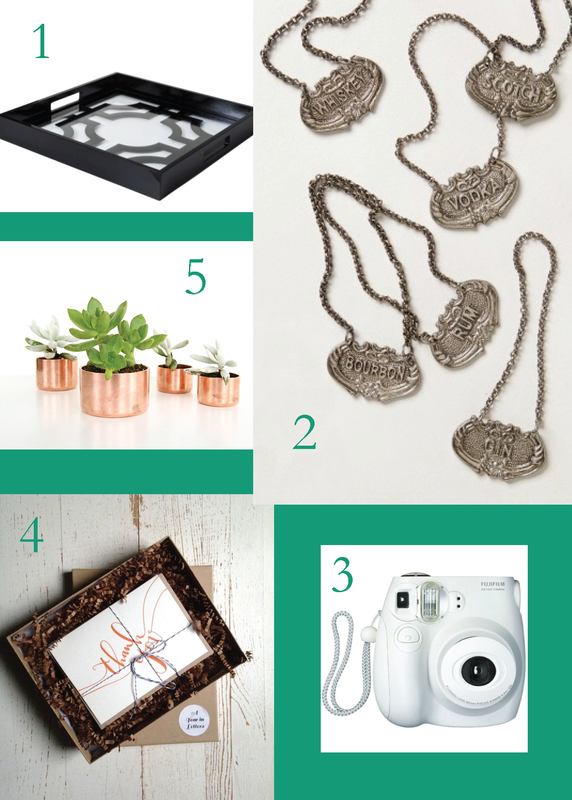 This entry was posted in Entertaining Basics and tagged gift guide, hostess gifts. Bookmark the permalink.